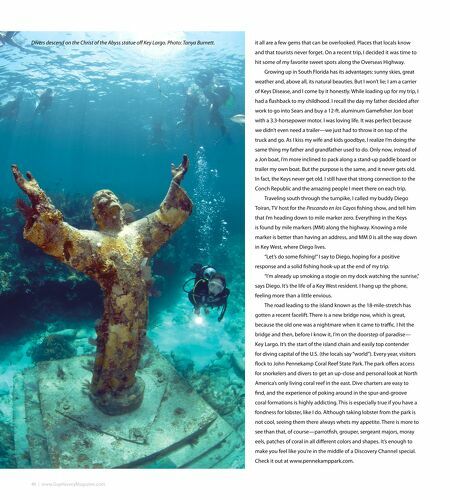 Divers descend on the Christ of the Abyss statue of Key Largo. Photo: Tanya Burnett. it all are a few gems that can be overlooked. Places that locals know and that tourists never forget. On a recent trip, I decided it was time to hit some of my favorite sweet spots along the Overseas Highway. Growing up in South Florida has its advantages: sunny skies, great weather and, above all, its natural beauties. But I won't lie; I am a carrier of Keys Disease, and I come by it honestly. While loading up for my trip, I had a fashback to my childhood. I recall the day my father decided after work to go into Sears and buy a 12-ft. aluminum Gamefsher Jon boat with a 3.3-horsepower motor. I was loving life. It was perfect because we didn't even need a trailer—we just had to throw it on top of the truck and go. As I kiss my wife and kids goodbye, I realize I'm doing the same thing my father and grandfather used to do. Only now, instead of a Jon boat, I'm more inclined to pack along a stand-up paddle board or trailer my own boat. But the purpose is the same, and it never gets old. In fact, the Keys never get old. I still have that strong connection to the Conch Republic and the amazing people I meet there on each trip. Traveling south through the turnpike, I called my buddy Diego Toiran, TV host for the Pescando en los Cayos fshing show, and tell him that I'm heading down to mile marker zero. Everything in the Keys is found by mile markers (MM) along the highway. Knowing a mile marker is better than having an address, and MM 0 is all the way down in Key West, where Diego lives. "Let's do some fshing!" I say to Diego, hoping for a positive response and a solid fshing hook-up at the end of my trip. "I'm already up smoking a stogie on my dock watching the sunrise," says Diego. It's the life of a Key West resident. I hang up the phone, feeling more than a little envious. The road leading to the island known as the 18-mile-stretch has gotten a recent facelift. There is a new bridge now, which is great, because the old one was a nightmare when it came to trafc. I hit the bridge and then, before I know it, I'm on the doorstep of paradise— Key Largo. It's the start of the island chain and easily top contender for diving capital of the U.S. (the locals say "world"). 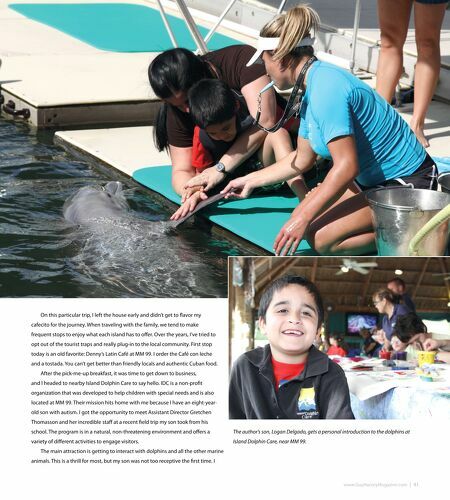 Every year, visitors fock to John Pennekamp Coral Reef State Park. The park ofers access for snorkelers and divers to get an up-close and personal look at North America's only living coral reef in the east. Dive charters are easy to fnd, and the experience of poking around in the spur-and-groove coral formations is highly addicting. This is especially true if you have a fondness for lobster, like I do. Although taking lobster from the park is not cool, seeing them there always whets my appetite. There is more to see than that, of course—parrotfsh, grouper, sergeant majors, moray eels, patches of coral in all diferent colors and shapes. It's enough to make you feel like you're in the middle of a Discovery Channel special. Check it out at www.pennekamppark.com.